I've been remiss in not posting a photo of the results of the recent destruction. Here you go. 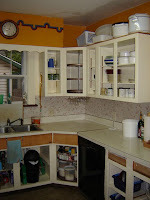 Yes, the color of the cabinets is different. Yes, the color of the walls is different. No, there was not a pattern on the North wall. Yes, the microwave has been relocated. Yes, the counter has been cleaned. Yes, I waited to take the picture until the dishes were done. GWLTBN: Hey, where ya live? B: Two blocks that way. GWLTBN: It's nice to see more white people around here. GWLTBN: You know, instead of all the Blacks and Latinos. B: They're alright. I like my neighbors. GWLTBN: I've lived here 14 years. There's just less and less Whites. B: There's lots where I live. B: Send 'em your way? I'm probably going to regret asking this, but how should that conversation have gone? That was my first thought when I read this little blurb in my RSS feeds today: "At what point should we consider the long-term ramifications of technological developments?" Full article is available on the NYT site (sorry, registration required). Radar School Hieroglyph Foot Ice Table Leg Onion Monster Clock Shower Swimming Pool Car Milk. Button Snail Baby Planet Boss Girl Signature. Circus Parachute Pants God Festival Festival Pocket. Sandpaper Alphabet Spectrum Crystal Ring Game Shop. Bathroom Fan Spot Light Highway Fan Family Bomb. Fruit Staircase Skeleton Cappuccino Circus Chair Bible? Liquid Fan Perfume Table Snail Arm Needle. Salt Shop Horse Album Cycle Chair Needle. Needle Airport Microscope Balloon Signature Computer Girl! I generally think I don't have many memories of my childhood. Then something happens. Today, while searching the office for an adapter, I had a vivid recollection of holding a sock in my hand, searching the house for its mate, only to discover that I was already wearing it. This happened when I was perhaps 7 or 8. I was in the dining room at the time. I found the adapter, also, though not on my person.